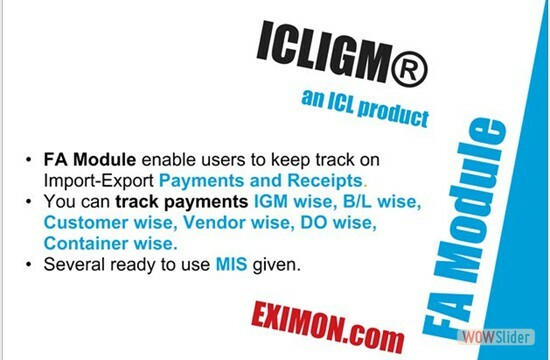 ICLIGM™ An Enterprise Software Solution for Shipping Companies, Shipping Agents, Freight forwarders, NVOCC and Liners. ICLIGM(R) An Enterprise Software Solution for Shipping Companies, Shipping Agents, Freight forwarders, NVOCC and Liners. 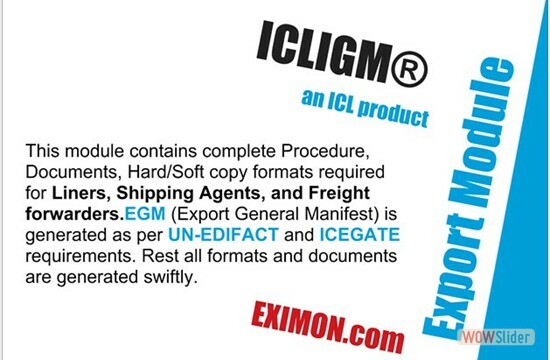 ICLIGM(R) Software is fully Compatible with ICEGATE / CUSTOMS / GST / PORTS. Register to check further details / Pricing. ICLIGM B/L Info Mobile App is absolutely Free and can be downloaded from Android Play store. This App is designed for your stakeholders / clients viz. CHA / CFS / Yards and Importers. Once CHA / CFS / Yards and Importers have this App, they can directly access Bills of Lading (B/L) info which is assigned to them like Arrival Notices, Delivery Orders and Containers. This module takes care of complete MIS reports pertaining to Import, Export, Container tracking and Finance. Several Web based Sub-Modules under ICLIGM(R) Web Modules are inducted regularly. This module takes care of complete Import procedure and documentation required for Customs and Ports. 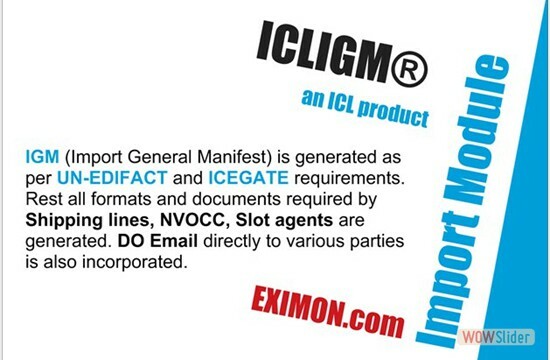 IGM (Import General Manifest) is generated as per UN-EDIFACT and ICEGATE requirements. Rest all formats and documents viz. Advance lists, Different types of IGMs, Arrival notices, Delivery orders(D/O), Examination orders, Invoices and different forms and letters required by Shipping lines/liners, NVOCC, Slot agents are generated based on IGM. D/O Email directly to various parties is also incorporated. e-D/O for DPD Cargo is also provided. This module contains complete Procedure, Documents, Hard/Soft copy formats required for Liners, Shipping Agents, and Freight forwarders. Complete Customs and Port requirements are taken care, start from Booking, D/O, Advance list, B/L (Bills of Lading), Invoicing, Etc. EGM (Export General Manifest) is generated as per UN-EDIFACT and ICEGATE requirements. Rest all formats and documents viz. EGM (Export General Manifest), B/L Preparation, Delivery Orders, Invoicing, Advance List, Outward Report, Mate Receipt Report, On Board and Shut Out Containers, Brokerage Bill, B/L Surrender, Freight certificate, Cargo Stuffing/Loading confirmation, Carting report, Export B/L registration report, Etc. are generated swiftly. Gate In Integration and On Baord Integration files are available readily. State of the art technology is used to generate Advance lists, etc. IGM: This module is very useful especially for Main line Agents. Before submitting to Customs you can test your IGM for any errors as per ICEGATE guidelines. You can also merge Slot Agent files. It allow you to rectify the errors on screen. Checks all the possible errors for filling IGM at Customs and ports and allow to rectify the same. House B/L Merging: House B/L received from different Agents in a prescribed format is merged within ICLIGM Module. Master B/L Register MIS report is also included in this Module. House B/L Merging module takes care of DPD cargo shipments also. Baplie Update and Compare: Baplie file is compared with ICLIGM Data and Bay/Cell location is updated accordingly. Container list comparison report is also displayed on screen. Main Line (Principal) File Integration: IGM file received from your Lines/Principal is decoded and merged within ICLIGM to generate ICEGATE IGM. EGM: Before submitting to Customs you can test your EGM for any errors as per ICEGATE guidelines. You can also merge Slot Agent files. EGM Testing Merging works of ICEGATE format and CSV format also. It allow you to rectify the errors on screen. Checks all the possible errors for filling EGM at Customs and ports and allow to rectify the same. Testing & Merging (Advance List-Import): You can merge slot agents Advance list data into your system and generate consolidated Advance list required by different ports / terminals. Testing & Merging (Advance List-Export): You can merge slot agents Advance list data into your system and generate consolidated Advance list required by different ports / terminals. Testing & Merging (DPD Cargo-Import): This module integrate Consignee list having DPD codes (as per ICEGATE) and DPD movements with IGM. A dedicated report is also provided. This module consists of entire Import and Export cycle of Container Movement from unloading from the vessel to Loading to the Vessel. Entire movement is covered step by step. Movement can be customised by user defined setups. Detailed report section provides the facility to check the status of Container or Containers at a glance. Various required calculations are provided to make your operations paperless and efficiently. 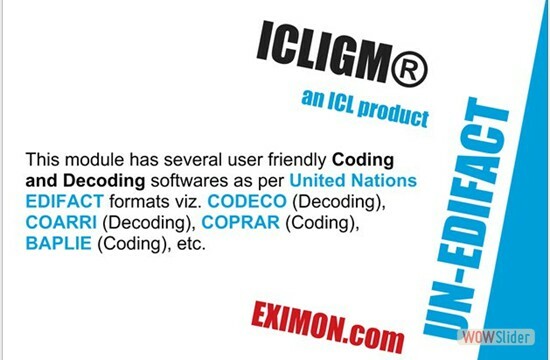 ICLIGM Software contains complete Procedure, Documents, Hard/Soft copy formats required for NVOCC, Liners, Slot Agents, Etc. Complete Customs, Ports, Rail, Road requirements are taken care with its state of the art technology. All kind of Manifests including IGM & EGM as per ICEGATE. Import & Export Advance lists required by various Ports. Arrival Notices intimations throe Email / Print / Mobile App. Delivery Orders / Examination Orders / e-D/O for DPD Cargo with Email / Mobile App facility. IGM & EGM Testing Merging module helps to check, rectify, Merge slot agents data and submit perfect file to ICEGATE. ICLIGM B/L Info Free Mobile App for your stake holders viz. Yards, CHA, CFS & Importers. ICLIGM Web Module to help you access MIS reports from your Data from anywhere. ICLIGM Software supports both Bulk and Containerised cargo. ICLIGM Software contains several ready to use integration modules viz. Main line, House B/L, Gate In, On Board & Baplie update and compare. ICLIGM Software contains hundreds of ready to use inbuilt Reports and MIS. ICLIGM Version control keeps your software always update and upgrade. So Don't worry about new versions. ICLIGM, India's Only EXIM ERP for maritime shipping business. 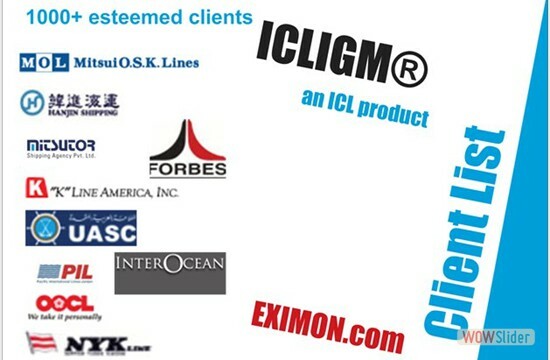 Since 1992 hundreds of shipping companies using ICLIGM Software happily. ICLIGM Version Control Utility makes sure that your Software is always upto date with latest updates and upgrades. ICLIGM Implementation Lot makes sure transparent and economical charges for customisation and new development. Successfully integrated with several Main Line Principal systems. ICLIGM-Web Modules. Dedicated portal for web based Module wise MIS reports. ICLIGM B/L Info free Mobile App. Most economical as per industry standard. Latest State of the art Word class technology and user friendly. We have consistent transparent customer support policy like crystal. We have dedicated team and positive attitude to resolve customer support related issues on priority. Prompt online human support throe Email / Chat / Telephone / Remote Desktop. ICLIGM Version Control Utility introduced in order to provide un-interrupted Core product and Customise Updates and Upgrades automatically/online.